A beneficial climate change hypothesis | Climate Etc. A novel hypothesis on the role of CO2 in the technological transition from hunter/gatherers to sedentary agriculture. This guest post has been formulating for several weeks. It summarizes a fascinating hypothesis in a guest post by Don Healy at WUWT some weeks ago, albeit posted for a different purpose. Credit where due; this is not my idea. It is merely my formal hypothesis formulation of his original insight, involving a lot of casual research outside my wheelhouse. Yet another Climate Etc. learning experience. It has been known for decades from archeology that the incredibly important technological transition from small bands of hunter-gatherers to sedentary agriculture (wherever possible) took place about 10,000 years ago. This transition eventually enabled specialization of labor, towns, cities, and all of modern civilization. This technological transition happened all over the world, in many ecosystems, with people geographically isolated, so independently developed. It was spontaneous, similar, roughly simultaneous, and ‘finished’ by about 9000 years ago. There are many archeological hypotheses as to how, why, and most importantly for this post, when. None satisfactorily explain the rough global similarity and simultaneity. We know from ice cores that the atmospheric CO2 level was ~180-190ppm at the last glacial maximum (LGM). We know that it was ~280ppm preindustrial, and that that level had persisted for millennia in the present Holocene interglacial. The natural ocean mediated rise in CO2 from near plant starvation levels to pre-industrial levels fully explains the similar and roughly simultaneous emergence of sedentary agriculture globally, as a simple function of plant primary productivity, foodshed dimensions and natural human behaviors. There are many aspects to this crucial transition, backed by thousands of science papers. There is no simple, single narrative, although I develop an overarching one here at the risk of oversimplification. Domesticated dogs (Canis familiaris) emerged from wolf progenitors (Canis lupus), probably twice. First domesticated in Europe about 16000 before the current era (BCE, and note this term itself conveys inherent timing uncertainty). And then, based on DNA evidence, dogs were domesticated a second time in Asia about 14000BCE. Both times likely as a result of scavenging cohabitation, with domestication many millennia before sedentary agriculture emerged. It is also likely that at least some animal domestication occurred before true sedentary agriculture emerged. This is easy to envision with grazing animals. Cattle were domesticated from wild aurochs perhaps 11000BCE in Meospotamia. Sheep were domesticated from wild mouflons about 11000BCE—and new genetic studies suggest not once, but twice, once in Asia and once in Mesopotamia, both about the same time BCE. (Pig domestication follows as an example of animal domestication as a consequence of sedentary agriculture.) All that was necessary is that the ecological foodshed was within a reasonable distance of ‘home base’ for the shepherds tending the grazers. Domestication would have proceeded in two steps. First, simply taming wild animals so they weren’t dangerous to humans. This is easy to imagine by capture near birth while hunting the mother for meat. Second, selecting for desirable domesticate traits (like docile, else eaten). So animal domestication is a process. Jarod Diamond says it took place before (grazing) or in parallel with (pigs) the development of sedentary agriculture and domesticated crops. The previous paragraph on grazing domestication introduced the idea of a foodshed. It is central to this climate/agriculture hypothesis, and borrowed from the idea of a woodshed, central to planning dimension lumber and plywood mill capacity in the forest products industry. A ‘shed’ is like a river catchment basin. The foodshed concept is quite simple. A hunter/gatherer band has to forage over an area that during a year (seasonality) provides enough food to sustain that band. A typical band might have been <30-50 individuals based on present day hunter/gathers. The poorer the productivity in the surrounding environment, the larger the band’s foodshed area was. Lower plant productivity means not just lower plant food availability for humans, it means less hunted animal meat from herbivores from other plants. As a familiar foodshed example, the Neolithic Plains Indians were hunter/gatherers because the conditions for sedentary agriculture never emerged despite agriculture being practiced in the American Southwest, the Mississippi River valley, and the East Coast. The high North American plains blossom in spring from winter snowmelt. But by late summer they are brown, desiccated, dormant grasslands. The bison that grazed those plains had to keep moving to find sufficient food year round since it only grew in spring/early summer. So did the Plains Indians that depended primarily on bison for food, shelter (teepee hides) and dung fire fuel. Their foodshed was very large. Their nomadic ways evolved technical innovations such as the travois and the teepee. But not sedentary agriculture, despite almost certain cultural exposure to it. About 11,000 year ago, things started changing all over the world. Sedentary agriculture began to to emerge. The most interesting thing is when the first wave of this fundamental technological revolution ‘ended’ with clearly domesticated suites of plants, animals, implements, and permanent settlements. Globally that was about 9000BCE. We will provide specifics in what follows. Taming/domestication of grazing animals is only a partial agricultural indicator, for reasons already discussed. The domestication of plants is a better indicator, and also one more archeologically certain. In general, like animals, neolithic plant domestication took two identifiable steps. The first was indehiscense. That means formerly foraged wild plants lost their ability for natural seed dispersal. Taking a plant category as an example, it meant the grains derived from grasses like emmer (wheat) did not shed their seeds as readily to natural wind and rain when ripe. This indehiscent property would have emerged and strengthened naturally. Hunter/gatherers gleaning what was left of ripe wild emmer would only have gathered seeds from plants already inclined to be indehiscent; the rest was more readily already lost. And every year, human driven selection would have increased that indehiscent tendency. The second was human selection for productivity. Larger seed size is the typical archeological example. The extreme is maize, human selected from wild progenitor teosinte. Some examples are illustrated below. An exception was the Papau New Guinea domestication of bananas, where larger fruit size was also human selected for smaller seed size. At several places around the world, the evidence points to the initial transition to sedentary agriculture being ‘completed’ about 9000BCE—despite completely different ecosystems. In Mesopotamia, wheat and barley. In China, millet and rice. In the New Guinea Highlands, taro and bananas. In Mexico, maize from teosinte. In southern Peru/northern Bolivia, the potato. Take the example of the crop ‘trinity’ of central and north America, maize (corn), beans, and squash. Nutritionally, these together provide all 20 essential amino acids. So, from a modern nutritional perspective, the ‘three sisters’ explain the huge population growth of Peruvian Incans, Yucatan Mayans, and Mexican Aztecs without an abundance of domesticated animals for meat. Modern genetic analysis proves beyond doubt that maize originated from the Mexican highland C4 grass teosinte, the original domestication transition finishing about 9000BCE. This is the most famous phenotypical human selected change of a wild type precursor plant. Modern genetic analysis of the common bean (P. vulgaris, another of the Amerindian ‘trinity’ of maize, beans, squash) shows it emerged at least two separate times (and possibly three) nearly simultaneously. Domesticated P. vulgaris began independently in Peru, (landrace kidney beans), in Mexican highlands (landraces pinto and red beans), and probably once more in lowland MesoAmerica (landraces black and navy beans), all around 9000BCE (depending on archeological site and landrace, anything between 10000BCE and 8000BCE). These landraces are all genetically similar, varying mostly in phenotype. How the phenotypes could vary so much without much underlying genetic differentiation is now understood thanks to growing knowledge of epigenetics. The third of the Amerindian trinity, squash (C.papo, predecessor to the pumpkin) was also domesticated before 8000 BCE. As a final near simultaneous timing example, hogs (pigs) are non-foraging so have to be fed domesticated plants. The pig was domesticated from the Eurasian wild boar (Sus scrofa) of which there are several subspecies that can be distinguished by variation in mitochondrial (maternal) DNA. Based on analysis of present day wild and domestic types, domestication happened independently in the Near East and in China from at least two separate wild boar subspecies at about the same time ~9000BCE. The dating is quite solid since based on mDNA mutation rates (a new standard ‘clock’ method). Darwin knew there were two basic domestic pig types, but not why. The Asian domestics were introduced into Europe for further cross breeding in the 18th and 19th centuries (the ‘subsequent introgression’ part of the linked paper title). Similar domestication timing around the world despite very different ecosystems and agricultural crops cannot be a coincidence. Nor can it be from cultural diffusion of agricultural knowledge; at that time, these areas were geographically isolated. There are several ‘explanations for this Neolithic revolution in technology. Wiki has a decent overview. The ‘oasis’ theory has largely been discredited. The ‘hilly flanks’ theory might explain Mesopotamia, but not Borneo. The ‘stable Holocene climate’ theory is falsified by the Younger Dryas. The ‘Younger Dryas’ theory might explain Mesopotamia. But not Bolivia or Borneo. The ‘it wasn’t simultanous’ theory depends heavily on dogs and grazing animals while overlooking much of the solid evidence for near simultaneity in plants and foddered animals like hogs or chickens. In short, it appears no one had provided a good explanation for simultaneity before Don Healy’s post. Ice cores suggest that the CO2 concentration at the last glacial maximum (LGM ~21,000BCE) was 180-190ppm. That compares to ~280 ppm pre-industrial and ~400 ppm now (with noticeable greening over the past 35 years). The change in CO2 concentration from the LGM to the Holocene is easily explained based on Henry’s Law and reduction in warming ocean dissolved CO2. The ice cores show that the CO2 rise lagged temperature rise by about 800 years, the period of the thermohaline circulation. For C3 photosynthetic pathway plants, that LGM CO2 level is quite low, hindering their productivity. About 85% of all plant species are C3. All trees, fruits, vegetables, and most food crops are C3. The only C4 food crop exceptions are maise, millet, sorghum, and sugarcane. There is an excellent long review paper by Gerhard in New Phytologist (2010) on this general topic. The paper describes experiments with various C3 plants over a growing season at the pre-industrial CO2 280ppm and at 150ppm, below the LGM level. On average, at 150ppm the primary C3 plant productivity was reduced an average 92% as measured by dry weight biomass. So at LGM CO2 levels, foodsheds would have necessarily been quite large, since plant photosynthetic productivity was low. Sedentary agriculture would have been impossible. As CO2 concentrations rose, foodsheds shrank. Eventually they would have shrunk to the point that permanent settlements with food storage became possible compared to nomadic temporary shelters, with food resources perhaps within just a couple days walk. At that point, the near simultaneous emergence of sedentary agriculture around the world–despite very different ecosystems–became inevitable. That has proven to be very beneficial. Climate change increased natural atmospheric CO2, which in turn enabled agricultural technology development. Which in turn enabled modern civilization. Which enabled exploitation of fossile fuels. Which further raised beneficial atmospheric CO2. The current further greening documented by NASA is also beneficial, with crop yields rising while needing less water. The opposite of alarming. This entry was posted in Climate change impacts. Bookmark the permalink. Thanks, Rud. Excellent well-explained article. I suggest that a “Summary for Policymakers” would be helpful. ie, send out a version that politicians and journalists could understand. Thought about that a bit while researching the background. Peer review– nope, not my insight. Healy’s to do; maybe your comment works as a prod. SPMs nope, politicized by definition. This is just my (on this topic, definitely a layman’s) take on a fascinating new hypothesis about one of the most important human technological innovations of all time. But you are welcome to proceed. Anything on Judith’s blog is fair game IMO. Ask her, but suspect she agrees. Hello Rud: I appreciate your kind comments above and want to let you know that what I wrote in the original post was a result of reading the posts of others over many years, with one by Andy May most recently, and others whose authors I can’t recall, triggering the idea as I was visiting the Oriental Institute at the University of Chicago. There they have displays on the progression of human communities laid out sequentially. Thanks to smart phones, when the thought crossed my mind, I was able to bring up a chart depicting ice core CO2 graphs and compare to what I knew from recent studies and vague recollections from a plant physiology class taken in about 1966. The concept seemed to make sense. While I plan to pursue this theory at my own pace, I do not view the idea as proprietary in any way and encourage anyone with an interest and expertise in this area to continue the scientific journey. It is very rewarding to see the interest the idea has created. Thank you for this post. It is very interesting. You certainly have a wide field of interests and are well informed on many that are relevant to climate and energy policy. drhealy, thank you for your explanation of what triggered the idea. Well done. Aren’t humans wonderful beings? as the true spirit of scientific enquiry. What’s up with pyramids in both Africa and South America? Does CO2 driven expansion of “foodsheds” explain that too? Look up independent invention rather than diffusion re: pyramids. Of course there may have been kindly star travellers who left wonderful things like pyramids and pizza. How else can there be pizza in so many places on our micro planetary orb? Rather than invoking aliens, why not consider the greater plausibility of ancient maritime capability. There is some suggestion of Egyptian sea travel to Java, and later hints (including inscriptions) of Phoenician voyages to North America. Then there were the remarkable Polynesians. And much earlier, the migration of peoples from Africa to Australia–though that would have been aided by the lowered sea levels of the last glaciation which exposed the Sunda shelf off of southeast Asia. I have wondered if a lawsuit could be brought against companies that capture CO2 for stealing fertilizer from the air. People who harvest green things that grow should be outraged that their tax money is used to build projects that steal fertilizer. We elected Trump to stop wasting time and money on these kinds of projects. I have a hard time accepting that Abbott and Perry support and praise this madness. A billion dollars for no benefit, just feel good junk for alarmists. I have always felt our farmers are best positioned to push back by saying we need more, not less, C.O. 2 . Rather have a greener, than a browner planet. Beautiful. It’s asking for experiments with plants growing with 180 ppm concentration. Great pictorial example. My submitted ‘official’ USDA images somehow got left off Judith’s post. No matter, you have fixed differently. TY. Here’s another one I hadn’t encountered. Increased CO2 at constant temperature -> increased growth and crop yield. Yeah it’s almost like terrestrial plants spent most of the past 500 million years since they appeared evolving under conditions of higher temperatures and CO2 ppmv. A very controversial statement to suggest , however after reading along,here goes. In order to better feed our growing world population we need more C.O.2, not less. Seems our farmers are best positioned to dare to say this. A greener world is tempting. Rud: There is a fatal flaw with the hypothesis that rising CO2 caused the development of agriculture. CO2 has risen after the end of ice ages many times in the past, but there was a difference between 10,000 years ago and 140,000 year ago. What was it? One difference may be a mutation in the FOXP2 gene (critical for human speech) during the last ice age. Whatever difference IN MAN made agriculture possible probably spread around the world during the last ice age. That difference would explain why agriculture developed only after the most recent ice age. I suspect that your post exaggerates the world-wide simultaneity of domestication of plants/crops and animals. Most of these events didn’t involve a single mutation, so they happened over time. While we can estimate when a single common mutation occurred in a particular crop, we don’t know that those mutants were deliberately “planted” by “farmers”. (I would define agriculture as the deliberate planting of seeds that could be eaten.) Teosinte starch grains from 9000 years ago with a common mutation found in corn don’t prove that corn was cultivated then. That requires archeological evidence. Unambiguous archeological evidence for some crops has been found in Mesopotamia and China around 10,000 years ago, but the evidence is less substantial that early elsewhere. The earliest sign of corn cobs (still very small) dates to 4000 years ago. Possible middle ground: Rising CO2 and photosynthetic productivity may have made it possible for a greater diversity of mutant populations to survive beginning 10,000 years ago (and at the end of earlier ice ages) and for some to be selected that early by man. Selection doesn’t need to involve intentional planting of seeds that could otherwise be eaten. Franktoo, thought about that, could have but chose not to include in order to provide a crisp post. Homo Sapiens emerge ‘ended’ supposedly ~150000 BCE in Africa. There is definite mDNA evidence that our species then spread globally by ~25000BCE (+/- the Americas ‘Clovis first’ controversy). Now it is possible earlier related species like Homo Erectus spread globally earlier (the Homo floresiensis controversy). There is doubt whether previous whatever species/subspecies (the debate still rages) Neanderthals and Dennisovians had the same linguistic and intellectual capabilities as Homo Sapiens, based on archeological remains (lack of cave paintings, grave goods, cultural ‘intellectual’ artifacts like jewelry). So the global presence of Homo sapiens (aka Cro Magnon in Europe) sets an earliest bound on the possible emergence of sedentary agriculture based logical simple behaviors of Homo sapiens. The simple rebuttal: earlier species/sunspecies lacked the intellectual capacity for the agricultural technology revolution. We did. Separate on logic. Planting saved seeds is a deliberate act. Not a nomadic accident. Technology, and only possible in a sedentary or proscribed seasonal nomadic path (the latter logically preceded the former). Separate on simulteneity. As the post said, phenotype variation did not depend on genetic variation. It was mostly epigenetics. Explained by the common bean example. Please read up on that very new (last 15 years) knowledge. Ristvan: Thanks for the reply. Looked for epigenetics, but haven’t found much so far. The concept of “domestication” is vague enough that assigning a date to the process is ambiguous. Which species was changed more by the process, man or crops? Did mutant plant species “domestic” man or vice versa? Once man had been domesticated, it is likely that man would select “domesticated” versions of other plants and animals. The difference was that this time the warming out of the ice age stopped at a perfect temperature cycle and people could stay in the same places longer and there were more people by that time. Temperature in the modern ten thousand years, in both hemispheres has been bounded in the same bounds. This warm period is better bounded than the warm period 130kys ago. That period got much warmer and then went back to much colder, keeping people, plants and animals on the move more. A little ice age caused people to move, but major ice ages caused people to move further and faster and they were just walking then, the warming periods back then caused people to move further and faster and they were just walking. Plants, animals and people could not stay in any place long enough to advance much. The following link leads to a lay persons view (hence the Rockyredneck avatar) of CO2 science and of climate science in general. Some interesting concepts there, regarding the dangers of CO2 and the its relationship to warming. Less than a month ago I visited a prehistoric sight turned into a museum, Terra Amata, ironically just around the corner from Sean Connery’s and down the road from Elton John’s. It contained tools used by inhabitants who lived there about 400,000 BC, and if correct that is at least four interglacials ago. It apparently shows clear signs of domestication and fire use. Is it possible that ‘humans’ abandoned agriculture during glaciations in order to uptake it again when the conditions become benign? Just looked that up on Smithsonian website. TY. Evidence of fire, definitely yes. Evidence of sedentary domestic ag from that site, no. Neanderthals had fire. Likely Homo erectus had fire. The neolithic stone scythe on the site (jawbone/stone inserts) is not from that site and dates to after 9000BCE. Google fu that specific pictorial example. Regards. Researched more about the subject, there are number of questions casting doubt on time scale authenticity of some items found there. It appears that the Terra Amata’s site value is mostly as a tourist attraction since it is located on the edge of the historic old town. Madam Curry, I sure appreciate Your desire to let all voices in the climate debate have a forum. But what about a tiny little bit of Quality control, aka peer review? RV, her denizens will be my peer reviewers. Much harsher than anything in academia. Been there, done that. Many times here already. And your specific knowledgable criticism of my carefully articulated hypothesis is? This is called post publication peer review and it is superior. Plus we have dpeditorial peer review by Dr. Curry. Some proposed guest posts are rejected. Good point Rune. One I’ve made many times over the years. Curry lets some real clunkers see the light of day here. This thread is what often occurs in the intellectual fermentation process. Speaking as an anthropologist and one who has done research on environtmental policy making down in the trenches of US – Mexico air and water issues, I find this issue beyond my immediate ken. Yet, as a teacher of an introductory course in cultural anthropoology, I have to reckon with many topics beyond my immediate research expertise. Anthropology is an eclectic physical AND humanistic science – from biological anthropology to archaeology to linguistic and socio-cultural anthropology. I’ve also been a llitigator and taught lawyering skills. So, yes, one needs to be able to separate the bs in life, including science and policy, but there are times to reach across the stove pipes of truncated peer mindsets. That is challenging. So, relax, enjoy the occasional brainstorming. Clearly, increased CO2 meant increased photosynthesis and increased biomass, and improved agriculture. But the rise of civilization is a complicated multifactoral matter. Have to keep CO2 benefits in context. And there were some sharp peoples pre-dating the HCO, including Neanderthals and later the Clovis cultures which either traveled well, or whose ideas traveled well because the points were found in North America as well as Europe. TE, ‘lucky’ for you dinner is for me yet an hour off. Yes, said is more complex than the oversimplified ‘overarching narrative’. True. Stone points indicate the cultural spread of specific neolithic technologies (like core/flake and Acheulian) . Lots of ‘napping’ articles on that from ‘mode 1’ to ‘mode 5’ subvariants. They do not in any way, shape, or form explain the near simultaneous emergence of neolithic sedentary agricultural technology world wide. Thanks Rud, highly interesting. There were I believe various attempts at cultivation long before the 10,000 BCE mark. The paper below describes one such in the fertile crescent some 23,000 years ago, as part of an investigation into the origin of weed species that accompany human cultivation. Maybe the rise of CO2 was the factor that tipped the balance from failure to success. But at any rate such attempts show that our species of human was culturally capable of cultivation techniques, including the use of sickle blades, some 10 millennia at least before the main agricultural wave. Re critical foodshed size, before rising CO2 drove this down at the end of the ice age, and considering the early attempts per above, perhaps in high bio-density regions (e.g. an equatorial forest), ‘garden agriculture’ societies were viable even during the ice age. Such societies exist in the modern era, of course. But whether one could detect their past presence underneath a modern jungle, would I presume be highly challenging. AW, teacher on meme matters, dunno. Did some preliminary paper research and got lost in peer reviewed bafflegab. Idea was tropical/temporate deltas, thinking Eskimos could never have developed sedentary ag. Yes, but they developed semisedentary seal/whale hunting. Proscribed small annual hunting foodshed radii. And the Arctic provided their semi permenent freeze storage. The adaptability of Homo sapiens is remarkable. Love you man. You’re always thinking. Your next impossible mission is to explain this to Eddie Bernice Johnson, the ranking Democrat on Lamar’s committee. Enjoy your dinner. I am in the midst of my cocktail hour and will check back later. MS, I am beyond cocktail hour. But decline your EJ offer. Some things are just impossible. Now to dinner. Ritualistic food and beverage consumption is a waste of time. It’s like having rituals surrounding putting gas in your car or changing the batteries in a flashlight. I suppose you might delve into the psychology of alarmism among scientists. Shouldn’t scientists be unemotional and non-magical thinkers – and yet many do so and are indulged by news media and will march on earth day to save the planet? But yet many scuentists get caught up in the ritual of saving the planet. So, how do we lock them up in science-making laboratories and away from casting planet saving magic? Science does not have any recommendations about what we ought to do. That’s a matter of religion and other values-ladden enterprises. In California, we passed an initiative to save the mountain lion, but not to save the mosquito. That’s about values. So, some of our discussion might well focus on values, the psychology of alarmism and other non-climate science endeavors since that human weirdness is what too often gets in the way of ‘pure’ science. I guess you don’t do Seders or Thanksgiving or Christmas goose. There was an interesting paper that found that advanced societies were all based on seed crops like wheat, barley, rice, and corn, while societies that relied on more productive root crops didn’t advance. The reason is that root crops can stay in the ground till needed, so there’s no easy way to raid a village and steal a year’s worth of food, and thus no need to develop the social organization to prevent that. So, I’ll ignore the root crops and focus on storable, once ripening seed crops, which we are all very familiar with. The basic question is simply energy invest versus energy gained using primitive tools under varying CO2 levels. Pick some early society like Egypt and calculate how many people a single farmer can support with his labor (three, for example), and then reduce the plant productivity by a factor determined from lab CO2 studies. If the low CO2 result is that the farmer can support less than one person (himself), or just barely more than one (less than a farm couple raising two children), then farming wouldn’t have worked as a viable survival strategy. GT, looked into that before posting. There are three problems with your alt thesis. 1. Early large societies did not depend on root crops. Example: the Egyptians that raised the Pyramids subsided on three main domesticated foods: beer from barley, bread from wheat, and beef from domesticated aurauchs. 2. There is no archeological root storage evidence circa 9000 BCE (beets, onions, carrots…) 3. Root vegitables (well, maybe excepting modern sugar beets) do not provide sufficient calories to be a subsistance food. Second disproof is the emergence of sedentary ag in Boreno (Papua New Guinea highlands) Taro is a starchy root crop. You would know in any grodery store as its dry starchy preservative as tapioca. That’s why I’m saying just ignore the root crops. Even if they worked as a food source, complex society probably wouldn’t result. Also, few root crops offer a sufficient mix of vitamins and minerals to allow people to stop hunting and gathering to get an adequate diet. So that means we’d just need to look at evidence from grain crop societies about the percentage of their population that had to be full-time farmers. If that percentage is high then a farm family could barely support more than itself Then you could look at the probably result of some percentage reduction in plant efficiency due to low CO2 levels and see if ice-age farming would have been viable on a large scale (not dependent on having a magic spot that can’t be replicated elsewhere). One of the most interesting aspects of the climate issue for me is the notion of good and bad. It all seems to begin with the assumption the human activity is bad. Arctic ice however, is good. It remains unclear to me whether it would be good if glaciers were to advance. We seem to be more accepting of the existence of infectious bacteria as a natural variant than our own. It is nice to see the consideration of the possible good. Ice huggers are the new tree huggers. David, your comment of ice in the Arctic being good, but maybe advancing glaciers not so much. Once again your thought on the source of huge amounts of moisture to grow the continental ice sheets. Was the western Arctic ice free and warm for most of the last ice age? Whenever I see a Plains Indian representation, they always seem to be on horseback which is strange to me since horses didn’t land on the Americas until the Spaniards brought them during the 16th Century. Hence, these peoples were pedestrians. The likely means of transportation was by boats on bodies of water; lakes, streams and ocean. The best ride is better than the best walk. These bodies of water contained fish and other animals (mollusk, lobster crab and crayfish) to provide sustenance. The inland peoples more likely traveled inland on boats and rafts carrying their fishing traditions with them. Planting crops required staying over the winter when the fresh waters froze. Hunting likely supplemented the dried fruits, nuts and berries that could be easily kept and carried. In the perspective of women, and in particular women who are pregnant, these are pretty fragile creatures (vitamins and other nutritional deficiencies). In fact, many of the Woodland people’s raids upon each others villages, were to obtain women since women’s death at childbirth and high infant mortality threatened the very existence of the tribe. Staying in one place, as opposed to constantly moving from one place to another, would be an attractive alternative as well as providing the socialization needed for child rearing (it takes a village to raise a child). Given the above, my best guess as to the reason for settling down in one place and having a family, was to preserve the tribe with its relatively low birth rate and for maternal survival. The only way to stay and winter was to eat through the poor growing season. To this day, when people are starving, they do eat grass, after all, some animals do it, so…. However, we only have one stomach and not 4 like cows, so people raised cows and other cellulose digesting mammals, who eat grass while people drink the milk. Cows/goats/sheep milk is the value, the meat is when the milk runs dry. The C3 and C4 grasses that have become staples, eventually were ground into powder, adding a little water, set aside sometimes allowing the natural yeast to further digest the complex sugars, baked and voila, bread. The kind of bread that lasts a while and even in our recent past as “hard tack”, a non perishable, source of calories for long sea-faring journeys. To preserve the tribe, there was a need to stay in one place and winter. To winter successfully, people began to mimic the animals around them, and when exact mimicry would not work, find other ways to make what was handy, the grasses, to be made into long lasting and calorically dense foods. Come on down and stay a while. Have a drink (fermented grain beverage) and a bite to eat. Wine, women and song. Survival at its finest. There is clearly a CO2 effect on plant mass, survival and reproduction – and may be linked to the development of agriculture. It is not – btw – a new idea. There is an idea of the alternation of savanna and woodland with CO2 levels – http://onlinelibrary.wiley.com/doi/10.1111/j.1469-8137.2010.03441.x/pdf – although I would suspect covariance with precipitation and deliberate human intervention in landscape evolution over at least 100,000 years. A theory says that the African savanna was the nursery of humanity – in which fire was an integral part of the story. It left us us with an upright posture, fine features – which facilitated language – and a big brain. The latter due to cooked food. The simultaneous development of agriculture is probably overstated as well. Rye was cultivated in Syria from wild stands some 11,000 years ago, gourds were cultivated in Asia from 10,000 years ago and grains were grown Middle East fertile crescent some 9000 years BCE. The technology evolved for 1000’s of years before the first city-states emerged. The suggestion here is that there was a tipping point where CO2 levels were sufficient to support agriculture – and It could well be that CO2 gave cultivation an energy advantage over hunting and gathering encouraging development of the technology. An idea far from proven. There is little doubt that deserts are greening – the effect is more pronounced in water limited environments – but that is not necessarily a good thing. So there are benefits that are exhaustible and far reaching – but unknown – consequences of tropic cascade. Trophic cascade is an idea illustrated nicely by the reintroduction of wolves to Yellowstone National Park. The presence or absence of key species changes biodiversity, species abundance and landscapes. Changes in aquatic and marine chemistry – and in terrestrial hydrology – will change the global ecology with uncertain consequences for key species within assemblages – even if they are only on phytoplankton.. I am obviously less convinced of the upside and more troubled by the downside than many here. It seems propitious then that the continued increase in CO2 in the atmosphere is most unlikely. We have lots of coyotes on my fairly large SW Wisconsin dairy farm. Lots of moonlight yapping. I will never forget the recent November deer hunting night at the cabin we heard a wolfpack howl at the moon. They were transient, but still on my land. Wintered by the round hay bail row way out back. Left in early spring. Helped out with the white tail deer overpopulation in those parts in the meantime. Am sure (but no pics) that the lower Wisconsin Riverway Golden/Bald Eagle population helped clean up the wolf kill carcasses. Not just the coyotes and bobcats (have trail pics of both). “Sedentary agriculture” seems to be somewhat of a misnomer to the extent there is a inference that early farming practices were more sedentary than, “Hunter/gatherer” activities –i.e., persons tending to spend too much time seated and being inactive. Agriculture involves being more stationary but as cultures, not as persons. My guess is that as cultures, more stationary agricultural societies used more energy than hunter/gatherer societies and if true, that fact alone is sufficient to explain why the trend to agriculture corresponds to greater wealth. W, I tried to portray a long ‘natursl’ transition. Because all human activities, along with all natural and manufactured objects, represent quantities of energy, a society’s per capita energy supply, taking into account the efficiency with which it’s used, is the best proxy for that society’s standard of life. It seems redundant to me– i.e., it makes sense to make a distinction between a nomadic vs settled lifestyle or said another way, living by hunting & gathering vs. agriculture. ‘Settled’ hunting & gathering’ might make some sense when it is possible to live off the land without moving around but how can you not be ‘settled’ when you are planting and tending crops? 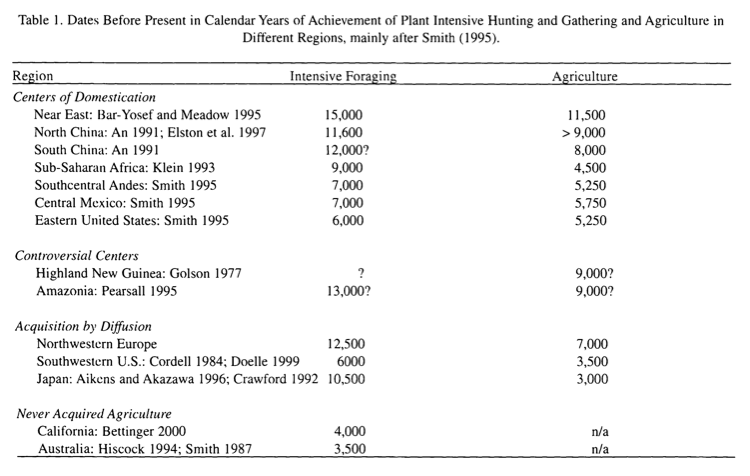 The better terminology as frequently used in anthropology is to follow Yehudi Cohen s adaptive strategies: foraging (hunting gathering), horticulture, pastoralusm, agriculture and later, industrialism. Rud, 50 years ago as a little Jew in Hebrew School, we used BCE, Before the Common era, because Jews preferred not to use that other term. It had an identical meaning, but in no way implied uncertainty. It was just a Jew thing. Seems stupid. “Common Era” immediately raises the question of what’s common. The answer would only seem to emphasize that which is being avoided. What would be a scientific, non-cultural referent to historical and geological time? Certainly not BC or BCE? We use ‘mya’ (million years ago) for geological time, but historical time is more perplexing. But then Protagoras reminded us that humans are the measure of all things – like the inch or the centimeter since it is us who pick the metric. I guess the earth is the center of the universe and the earth is flat and I will ruin the atmosphere by driving a car and eating gluten. My precise post definition, had you checked, was current era. You want to argue, at least get the post definitions right. Sad. Perhaps because Australia didn’t have many plants that could work well for sedentary agriculture. Link to some of them. Even though wild or semi-domesticated plants may be an important component of a diet, until you can meet all your nutritional needs (vitamins and minerals) through farming, you still have to hunt and fish. Large human populations can’t form while relying on wild game because we deplete it, requiring longer and longer forays to areas that still had abundant game. And without draft animals and the wheel, that game can’t easily be transported back to a fixed settlement. So as many North American Indians found, it was easier to keep moving the tribe between temporary villages than to stay in one place. Finding lots of abandoned villages is one reason Europeans assumed that some sort of plague or other calamity must have just struck the Indians, because Europeans would never conceive of just abandoning a settlement as a matter of routine. In Europe villages stayed occupied and defended for countless generations. Hrj, the question is why agriculture did not emerge in Australia. Certainly there were suitable geographies on the continent. Been doing some reading cause it is a veryinteresting question. There are two irreconcilable views. One asserts that agriculture did emerge, with permanent settlements. The strong version asserts extensive fields of ‘wild’ yams were actually a form of agriculture since after harvesting the tuber the crown would be replanted. The weak version claims that ‘firestick agriculture’ is half way to sedentary agriculture because it created small productive nomadic foodsheds. The other (majority view) is that neither practice involves domestication so is not sedentary agriculture. There are two subtheories as to why. First observes that aboriginals ate a very wide variety of foodstuffs and this insured plenty over the intense drought /wet cycles common on the continent. Narrowing diet to fewer domesticated plants/animals would have been too risky. The other asserts that food was sufficiently abundent in the more intensely inhabited regions that there was no ‘incentive’ to evolve from hunter/gatherer, especially given firestick practices. There is more than one pH.D thesis lurking in your question. Thanks,could not agree more, warm times are good times for plants,thus man due to more CO2. Was surprised to see the 800 year time lag for carbon dioxide to follow temperature rise. Today a new archeological site was aged at 14,000 years. Location was on an island west of Prince Rupert, British Columbia , N.A. Question? What warming was happening in the Arctic near the Mckenzie River delta during the last ice age? Origen of man in N.A. About 24,000 years ago after holding up in the warm, lush Berring Strait area for 9,000 years. Same time as continental ice sheet to 40 degrees north. Arctic needed to be ice free to allow huge percipitation to build the ice sheets. Rocky Mountains rain shadowed area from the Pacific. An enjoyable essay. Thank you, Rud Istvan. Lots of food fer thought, Rud … Meaty even. My primary problem here is that the hypothesis depends on ice cores providing accurate measures of past CO2 levels. The problems with this theory are well known. I am inclined to think that CO2 levels fluctuate naturally, far more than ice cores indicate. Another problem is that the number of people in a agricultural unit was so small that it is hard to see low productivity as precluding agriculture. Agriculture requires certain knowledge and technology, which has to be discovered and invented, especially food preservation. These might well be more important than plant productivity. See my above at 6:17pm on the 7th. From prior attempts that eventually fizzled out, we know that at least some of the knowledge and technology existed long before the main agricultural wave; in the case of the referenced paper at least 10 millennia before. It seems at least a plausible possibility that the difference between long-term success and the prior failures, was increased plant productivity. P.S. although another possible factor is that some later communities were much more motivated to succeed, because the population density got to a level whereby the large mammals sustaining them were hunted out. This is consistent with the significant drop in health for early agro communities noted by lloyd56 below. Having just some technology might well explain the false starts. Most startups fail. Absolutely they do. But if significant external factors happen to be moving in a promotional direction, more will succeed. In this case increased plant yield and reduced hunting opportunities, would both seem like plausible candidates for such factors. Reblogged from Dr Curry’s Climate etc. Excellent analysis of climate change and our own change from hunter gathering to agriculture. Interesting how it supports the idea that CO2 is the control knob for the climate. 180 -> 280 ppm CO2 and presto we have civilization. We have seen 280 -> 400 ppm in 100 years…. Not really, because climate is not a factor. Note that the recent CO2 rise helps explain the 100 year green revolution. Good in both cases. The end of the last ice age 12K to 10K years ago was a change in climate, I.e. It got warmer. 180 -> 280 ppm CO2 made it warmer and more conducive to greening in addition to providing more atmospheric plant food. The natural increase of CO2 drove that change. Modern civilization then occurred. Coherent… Supports CO2 as the control knob. The title said climate change, but I guess that was a mistake. Except that the rise in CO2 followed the rise in temperatures as warmer oceans outgassed it. If the control knob was the other way, the earlier hunter-gatherers must have been using big SUV’s to transport their downed woolly mammoths. In this case the CO2 was a positive feedback to the warming from other forcing changes, but it is precisely because CO2 has its own warming effect that it was a positive, not negative, feedback. CO2 isn’t a control knob it’s an on/off switch that controls whether the earth’s surface is covered by ice or liquid water. Great post. Once farmers settle, are they committed to staying even during bad crop years, or several bad years in a row? One can imagine experiments that sometimes succeed, and sometimes fail–some groups “returning” to grazing or hunting/gathering. Homo sapiens toughed it out, enjoying the benefits Rud mentions. There was a huge upside in the ability to communicate and learn. When science merges with progressive politics, there is a tendency to say “progress” is a mixed blessing at best, “civilization” may be more bad than good. There’s a piece in Science Direct that says human bones got bigger (again) in the twentieth century, with people consuming more calories, but: “bigger bones may not be stronger; calories may not be good calories.” Monty Python’s Life of Brian: What exactly has the Roman Empire done for us? Well yes, roads, laws, …..
It’s Interesting how the Industrial Rev changed everything. Dr Hans Rosling explains how average life expectancy was under 40 years of age in 1810 but had increased to 80 years of age by 2009 in the first world. And developing countries catching up fast as soon as they started to use fossil fuels. Here’s Dr Rosling’s video showing this remarkable change from 1810 to 2009 and contains all the data in just 5 minutes. Incredible video to watch. Today a baby born in the first world has an average life expectancy of 90 years of age. And in this next video Rosling explains how even tertiary educated people are ignorant about the human advances in the world. Just watch the first 5 minutes of this video to understand how ignorant people seem to be about our modern world. Even the chimps in the zoo beat them. I couldn’t believe this, but apparently Rosling has tested this all around the world with the same appalling results. Unbelievable but true. Make sure this video link starts at the beginning. How little we know. So many records lost waiting to be found. Evolutionary wise quadrupeds have been present for at least 250 million years. All share similar lungs, brains and vertebral structure. Thinking capacity, eyesight and hearing has been highly developed in many species. Successive ice ages may have been important in stressing humans to develop storage and farming capacities. Amazing to think that the capacity to record and transmit our past thoughts and history is what has pushed the last frontier. More amazing the ability of plants, animals and humans to collectively genetically adapt and help each other out. Thanks for your views on this topic Rud. An interesting side note. BEER. The Museum of Man in San Diego had an exhibit about the emergence of beer in many cultures. I seem to recall that the earliest archaeological evidence was about 8000 BCE. The point might take us to a motivator for sedentary agriculture. Inebriation and having a good time is hard to measure but the anthropological record (and classical literature of a later period) acknowledges those things that make the human condition bearable – from wine to beer to psychoactive substances. Of course, psychoactive substances likely preceded those associated with agriculture and tied into shamanic practices of hunter gatherers. This takes us away from CO2, but the leading edges of social and technological were likely spurred by interests beyond material subsistence. The spiritual world, magic and dealing with the unknown travelled side by side with the pragmatics of food production. Several other factors likely influenced the shift to agriculture; many of which are know factors in drendochronology adjustments; viz., precipitation, temperature, and sunlight to name a few. Additionally, Critical mass in population density must have played a leading role for three apparent reasons. First, occupiers of preferred environs, would be loath to travel outside home territory; lest they be occupied by squatters. Second, the chances of remarkable births increases in direct proportion to population. Third, x-n population density is required for global transmission of agricultural technology. If I may say so, I think perhaps you are missing the big picture here. It’s been a frequently discussed topic in my family, who was the first person to discover how to make beer? What rewards would they have received? Would they be welcome wherever they went? Trivially beer making creates CO2. That’s not the impact though, civilisation did not happen because CO2 increased though it might have helped. Families bonded so that could make & share beer and that’s it. Beer was suggested upthread, so I did some reading this afternoon while watching the Masters. Earliest evidence of beer is from Iran about 6000BCE. That is about 3 millennia after agriculture was firmly established. Among the additional technologies that had to be developed first was pottery, which only makes sense once permanent settlements are established. Interestingly, both that beer and the early Egyptian beers were apparently made from baked barley bread, not malted barley and may have been more like a gruel than what we know as beer today. A fermented food more than a beverage. And both Egyptian and Sumerian brewers were almost exclusively women, further strengthening the food supposition. Thanks for the reply and apologies for implying you were missing the big picture. Fermentation and bread making may have been known about before agriculture though. A wooden store of fruit or grain or bread that was flooded might produce something alcoholic by accident and be incorporated into a nomadic lifestyle thereafter by design for both it’s pleasurable and anti bacterial properties. We have evidence of brewing at the time of first writing and pottery. Perhaps nomads observed drunken boars feasting on rotten fruit and or there was a happy accident earlier. Two considerations on early consumption of fermented liquids. First, fruit gets naturally fermented and chimps in the wild go for the buzz. Likely that hominins were aware of the buzz. Second, the cultivation of grain or fruits for inebriation can be found in the archaeological record of prehistoric China to about 6600 to 7000 BC. For me, there are two aspects: one is the connection of what any species does (including humans) and impacts on the immediate (think pollution) environment and the wider environment (think alleged climate change impacts; the other is motivating behavior (self interest) and coerced behavior change (social engineering). This is a fascinating hypothesis, explaining the near concurrent emergence of neolithic-type agricultural systems in the Near East, South America, Mexico, and New Guinea. However, to accept it, one would have to reject the critique of core-derived measurements of historical CO2 levels offered by the late Zbigniew Jaworowski. In various locations, Jaworowski argues that the complex processes of ice sheet formation (including alteration of snow into firn, evaporation, depth hoar formation, and meltwater seepage), as well as the material relaxation that occurs during core recovery, renders our attempts to estimate historical atmospheric CO2 concentrations based on core sampling highly unreliable. LH, Jaworski is a definite outlier. I read up quite a bit on this in researching what became essay Cause and Effect in ebook Blowing Smoke. I think I trust the mainstream papers on Vostok, Epica Dome C, and Greenland’s GISP2 and NEEM. Wilson and Long, New approaches to CO2 analysis on polar ice cores, J. Geophys. Res 102: 26,601-26606 (1997) discusses several possible reasons why Byrd is a clear outlier. See fig 3 and the accompanying text. No it does not. Wikipedia is not a decent tool for research. The hypothesis was first proposed to my knowledge by Rowan Sage in 1995, so it is good that Don Healy does not view the idea as proprietary, since he was beaten to it by 23 years. Sage, Rowan F. “Was low atmospheric CO2 during the Pleistocene a limiting factor for the origin of agriculture?.” Global Change Biology 1.2 (1995): 93-106. This synchrony in agricultural origins indicates that a global factor may have controlled the timing of the transition from foraging to food-producing economies. The global factor may have been a rise in atmospheric CO2 from below 200 to near 270 μol mol−1 which occurred between 15,000 and 12,000 years ago. The article started a controversy that was continued in 2001 by Richerson et al. Richerson, Peter J., Robert Boyd, and Robert L. Bettinger. “Was agriculture impossible during the Pleistocene but mandatory during the Holocene? A climate change hypothesis.” American Antiquity 66.3 (2001): 387-411. “Recent data from ice and ocean-core climate proxies show that last glacial climates were extremely hostile to agriculture -dry, low in atmospheric CO2, and extremely variable on quite short time scales. We hypothesize that agriculture was impossible under last-glacial conditions. The quite abrupt final amelioration of the climate was followed immediately by the beginnings of plant-intensive resource-use strategies in some areas, although the turn to plants was much later elsewhere. Almost all trajectories of subsistence intensification in the Holocene are progressive, and eventually agriculture became the dominant strategy in all but marginal environments. We hypothesize that, in the Holocene, agriculture was, in the long run, compulsory. Plant productivity was also limited by lower atmospheric CO2 during the last glacial. The CO2 content of the atmosphere was about 190 ppm during the last glacial, compared to about 250 ppm at the beginning of the Holocene (Figure3). Photosynthesis on earth is CO2-limited over this range of variation (Cowling and Sykes 1999; Sage 1995). Beerling and Woodward (1993; see also Beerling et al. 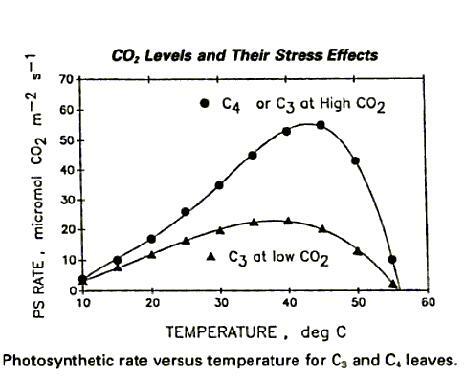 1993) have shown that fossil leaves from the last glacial have higher stomatal density, a feature that allows higher rates of gas exchange needed to acquire CO2 under more limiting conditions. This higher stomatal conductance also causes higher transpiration water losses per unit CO2 fixed, exacerbating the aridity characteristic of glacial times. Nor does anyone. The conditions were very hostile to agriculture from all these factors. During glacial periods land ecosystems have much lower productivity. That’s the bottom line. Gupta, Anil K. “Origin of agriculture and domestication of plants and animals linked to early Holocene climate amelioration.” CURRENT SCIENCE-BANGALORE- 87 (2004): 54-59. Gerhart, Laci M., and Joy K. Ward. 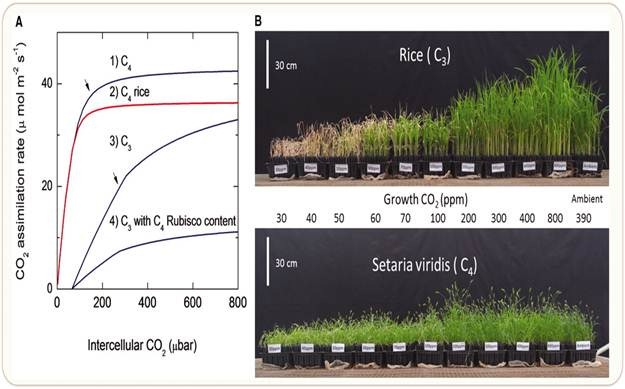 “Plant responses to low [CO2] of the past.” New Phytologist 188.3 (2010): 674-695. “A plethora of past work strongly suggests that the increase in [CO2] that occurred between 15 000 and 10 000 yr ago may have been large enough to have had a profound impact on crop productivity, and hence on human subsistence patterns (Sage, 1995; Fig. 9). In general, glacial conditions would have been a hostile environment for C3 crops because of low [CO2], as well as drier soils and higher seasonal variation (Richerson et al., 2001). As the interglacial period commenced, the onset of rising [CO2] and other climatic changes would have removed an environmental limitation to the development of agriculture (Sage, 1995). Increasing [CO2] during the interglacial period may have directly enhanced plant productivity and may have reduced the effects of interactive stressors, such that crop production could be sustained year after year within human societies (Sage, 1995). Dow, Gregory K., Clyde G. Reed, and Nancy Olewiler. “Climate reversals and the transition to agriculture.” Journal of Economic Growth 14.1 (2009): 27-53. Very much. Thanks for the excellent references. Javier, thanks for the additional research. Very helpful. One comment. In matters not so political, I find Wiki a useful quick start to finding themes, authorities, and words for a deeper basic google search, especially in unfamiliar topic areas. QC is by checking the article footnotes. Academic papers, ok. Newpaper articles, not ok. The papers you cite have idea priority. But they are certainly not mainstream archeology. Again, thanks for deepening and broadening the dialog. It is not unusual for new ideas to come from fringe areas, and the recognized importance of climate in shaping natural history has been gaining increasing acceptance also in human history. Mark Nathan Cohen is a well respected anthropologist that became famous in 1977 when he published “The Food Crisis in Prehistory” that became one of the leading hypothesis on the origin of agriculture based on an imbalance between population and resources. Cohen, Mark Nathan. “Introduction: rethinking the origins of agriculture.” Current Anthropology 50.5 (2009): 591-595. “What follows is my own perspective on the problem, modified and updated by more recent research and, most recently, by participation in the conversation. I take pride of place as organizer and also as the person providing the most primitive, albeit drastically updated, hypothesis. Some tenets of the model still apply; others do not. But we have to distinguish babies and bathwater. So in 1995 it was a fringe hypothesis, by 2001 had gained ample exposure with Richerson et al. article, and by 2007 it was accepted as a possible explanation by one of the popes at a meeting on the origins of agriculture. It is these people’s work. It is highly unlikely that we can think something relevant about it that they haven’t thought already. Javier: The references you have provided are excellent and I am both enjoying and learning a great deal from them. Regarding your comment: “The hypothesis was first proposed to my knowledge by Rowan Sage in 1995, so it is good that Don Healy does not view the idea as proprietary, since he was beaten to it by 23 years.” I never meant in any way to imply that it was an original concept as very few ideas ever are. However, with so many in the mainstream pushing the idea that exceeding 300 to 400 ppm of CO2 in the atmosphere dooms us, I wished to indicate that since our current needs and life styles require at least 250 to 270 ppm, a target zone of 250 to 300 or 400 is both impossible and unreasonable. Especially so when higher levels are so beneficial to the plant community upon which we all depend. Thanks again. I am enjoying the new contacts on this interesting journey. I agree with everything you say, and I am glad that you enjoy learning about these issues as much as I do. Since neither Rud, you, nor I are anthropologists, we are not supposed to know this much about the origins of agriculture and about the theories that the people studying it propose. It is actually a very interesting development that people from such different backgrounds are coming to the realization that the raise in CO2 levels at the start of the Holocene might have a lot to do with the current levels of comfort most people in developed societies enjoy. Pingback: Weekly Climate and Energy News Roundup #265 | Watts Up With That? In the United Arab Emirates, near Abu Dhabi, there is a small forest of saxaul trees. It is described on the Abu Dhabi information website, The trees evolved by condensing what little water is in the air at night. The water ultimately drips to the ground, and is absorbed by the roots. The trees of the Dew Forest, as it is known, grow to no more than about fifteen feet in height, limited by the distance a water drop can fall before it completely evaporates. So next time you’re in the UAE, you might consider a sunrise outing to the saxaul forest, where you can see the Abu Dhabi dew. I, for one, am looking forward to some quantified data to support/disprove the thesis. The concept of foodshed combined with known human mobility limits leads very well to relatively accurate estimations on foodshed size – especially combined with reasonable guesstimates on food crop nutritional value in the ancestral strains. I believe that there are more modern examples where the foodshed idea also has utility: the MidWest prior to the mechanical reaper. Prior to the mechanical reaper, the MidWest was not the grain basket of the US/world because relative yields are low. With the reaper – which increases the mobility/productivity aspect of farmers and in turn increases the “foodshed” size, that’s when the huge scale of the millions of acres in the MidWest, combined with rail transport, into what it is today. The impact of mobility/productivity thus matters: a 10% or 30% delta in per unit (plant) productivity then has massive impact on the nutritional economics of a farmer. Very interesting article. Extrapolate the linear effect of rising CO2 to support agriculture and culture to contemporary times, where increasing CO2 levels have enabled the planet an ability to support an ever increasing population of us bad humans. The Breakthrough Institute published some interesting work a while back that related to a decoupling effect, where increased productivity of food crops ironically has been returning the planet back to nature (don’t tell the Lefties). A good deal of food productivity is because of the rise of CO2, but also technology. My summary; both technology and CO2 have risen synergistically to benefit humans, one wouldn’t have increased as much without the other, ironically the net result is a return to nature. Contrary to the expectations of many professors and preachers, America began to spare more resources for the rest of nature — first relatively, and then more recently in absolute amounts. A series of “decouplings” is occurring, so that our economy no longer advances in tandem with exploitation of land, forests, water, and minerals. American use of almost everything except information seems to be peaking. This is not because the resources are exhausted, but because consumers have changed consumption, and because producers changed production. These changes in behavior and technology are today liberating the environment. Agriculture has always been the greatest destroyer of nature, stripping and despoiling it, and reducing acreage left. Then, in about 1940, acreage and yield decoupled in the United States. Since then American farmers have quintupled corn while using the same or even less land (Figure 1). Corn matters because its production towers over other crops, totaling more tons than wheat, soy, rice, and potatoes together. Figure 1: Decoupling of US corn production from area farmed. Data source: US Census Bureau (1975, 2012). Crucially, rising yields have not required more tons of fertilizer or other inputs. The inputs to agriculture have plateaued and then fallen — not just cropland but nitrogen, phosphates, potash, and even water (Figure 2). A recent meta-analysis by Wilhelm Klümper and Matin Qaim of 147 original studies of recent trends in high-yield farming for soy, maize, and cotton, funded by the German government and the European Union, found a 37 percent decline in chemical pesticide use while crop yields rose 22 percent. This is the story of precision agriculture, in which we use more bits, not more kilowatts or gallons. The average yield of American farmers is nowhere near a ceiling. In 2013, David Hula, a farmer in Virginia, grew a US and probably world record: 454 bushels of corn per acre –– three times the average yield in Iowa. His tractor cab is instrumented like the office of a high-speed Wall Street trader. In 2014, Hula’s harvest rose 5 percent higher to 476 bushels, while Randy Dowdy, who farms near Valdosta, Georgia, busted the 500-bushel wall with a yield of 503 bushels per acre and won the National Corn Growers Contest.